Introduction Baltic Sea is well known for seasonal ice cover. Current study is focused on Gulf of Riga that is located in the eastern part of the Baltic Sea. Previous studies have shown that the ice conditions in Gulf of Riga can vary significantly from year to year depending on the weather conditions . Depending on the year the ice cover season starts between late November and middle January. The length of the ice season which can last until late April is in the range of 3-5 months. In addition to interannual ice cover variations there are significant spatial variations between different Gulf areas. The use of remote sensing methods enables to monitor ice extent during different winter scenarios . Although during the last years the emphasis in operational ice remote sensing has been on exploiting the capabilities of active sensors (e.g. SAR) the optical imagery can provide valuable information as well. Data from Moderate Resolution Imaging Spectroradiometer (MODIS) can be used for ice extent monitoring and for characterization of average winter conditions. Aim The aims of the study are to obtain accurate high resolution information about ice conditions from satellite imagery and to characterize ice cover extent during different winter scenarios. Data and Methods We used MODIS data from visible range channels of spectrum with 250 m resolution (620 - 670nm ; 841 – 876 nm) to detect ice extent in the Gulf of Riga (Baltic Sea). In total 366images were used for ice extent detection. 107 images were cloud free over the entire study area and 259 were partially clouded (cloud free > 50%). To distinguish ice from open water a threshold value was found for each image. The threshold value was set by using histogram analysis that is described in papers , . For classification purposes a histogram was calculated for a MODIS image subset where a wide range of reflectance values were representing different ice concentrations. The two modes (data peaks) of resulting bimodal histogram represent the open water and ice cover reflectance values at given band. 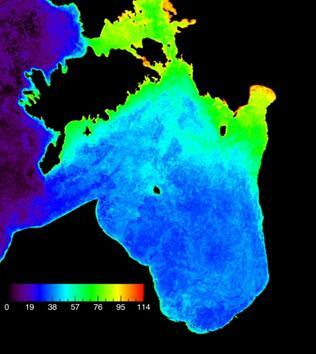 The MODIS images were classified (water/ice) using these values as thresholds. After processing all the 366 images the average ice cover maps for different months and years were calculated. 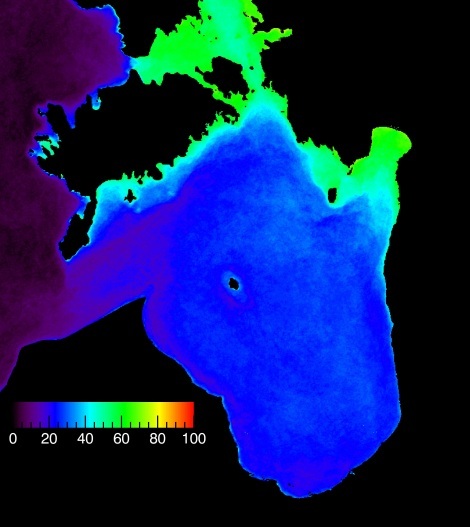 The ice cover probability maps were calculated which showed the percentage of time that each pixel was covered by ice. Based on the average ice cover maps the winter scenarios were defined. Figure 1 . Maps showing the ice probability with 1km spatial resolution during different winter scenarios. (a) Mild winters 2006/2007, 2007/2008 and 2008/2009, (b) medium winters 2003/2004 and 2004/2005, (c) severe winters 2002/2003, 2005/2006, 2009/2010 and 2010/2011. Figure 2 Ice seasons during 2002-2011. Image showing the percentage of time that each pixel was covered by ice. Figure 3 Image showing the number of ice days during different winter scenarios. (a) Mild winters 2006/2007, 2007/2008 and 2008/2009, (b) medium winters 2003/2004 and 2004/2005, (c) severe winters 2002/2003, 2005/2006, 2009/2010 and 2010/2011. The average ice cover map which includes data from 366 images shows, that on average the maximum number of ice days during 2002-2011 was 114 days (Fig. 4). The ice covered the open part of Gulf of Riga around 30-40 days. References  Jevrejeva, S. and M. Leppäranta. 2002. Ice conditions along the Estonian coast in a statistical view. Nordic Hydrology 33 (2/3): 241-262. Zhang, D., Ke, CQ., Sun, B., Lei, RB. and Tang, XY. 2011. Extraction of sea ice concentration based on spectral unmixing method. Journal of Applied Remote Sensing 5, Article Number: 053552. Uiboupin R., Axell L., Raudsepp U., Sipelgas L (2010). Comparison of operational ice charts with satellite based ice concentration products in the Baltic Sea. In: IEEE Xplore: 4th IEES/OES Baltic Symposium, Riga, Latvia, August 25-27, 2010. IEEE-Inst Electrical Electronics Engineers Inc, 2010, 1-8. Uiboupin, R., Sipelgas, L., Raudsepp, U., (2009). Sea ice concentration and type analysis from dual pol Radarsat-2 and Modis images in the Baltic Sea . In: IEEE Proceedings of International Geoscience and Remote Sensing Symposium: International Geoscience and Remote Sensing Symposium. IEEE, 2009, (2), 590 - 593.